When I started seriously trying to lose weight, I had a problem that many people don't consider – eating. Yes, I will admit, I am one of those girls who will skip breakfast and lunch if I'm not careful. Now, I am having diet shakes and trying hard to fit in the healthy snacks. For me, finding the perfect snack is more the issue. While I love apples, I am very quickly getting bored with them. On my search for the perfect, low calorie, nutritious health food, I was approached by Seapoint Farms, asking if I was willing to try their dried edamame snacks. Since I've been a huge edamame fan for some time, I couldn't wait for these packaged snacks to arrive! Do you love edamame? If so, we think you will love Seapoint Farms selection of edamame vegetable products and snacks. As the largest importer and manufacturer of edamame in the United States, they are proud to offer high quality, good tasting products at a variety of different American supermarkets and food stores. As a matter of fact, in 1996, they were the pioneering company to bring these quality foods to the American public. not only are they proud to offer gluten free, non-GMO soybeans, but offer them in a variety of flavors for adults and children alike! I will admit, I am not new to the Seapoint Farms brand. When I go grocery shopping, I love to get their frozen shelled and unshelled edamame to eat as a treat. Since I am a big fan of edamame, I couldn't wait to tear into these bags and see what I thought of the dried form of my favorite treat. As someone who loves edamame, I was in heaven. The lightly salted edamame berry blend of the dry roasted edamame seem like the perfect healthy treat if you need a quick snack. The real treat to me, however were the Premium Black edamame. I had never had black edamame until I opened this bag, and I will admit, it is a treat. This edamame is slightly sweet and has a very unique taste that I think is truly yummy! To say the least, I think I have a new favorite snack food for around the house or for in the car the next time we go on a road trip. Based on my experience, I am happy to give Seapoint Farms Dry Roasted Edamame an A+ rating! Want to try some of the delicious edamame products featured in this review? You can find these packets of dried edamame or frozen edamame in most grocery stories and health stores, such as Kroger, Meijer, Sam's Club, Wal-Mart, and other well known retailers. As well, you can find a variety of their edamame product on Amazon.com. this is an unknown product for me. i would like to try it. 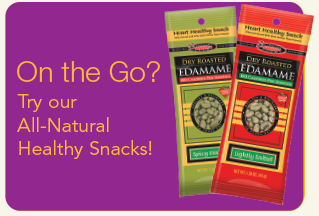 I would like to try Seapoint Farms Dry Roasted Edamame snacks in the berry flavor. This would be a good snack for work. I like Edamame.